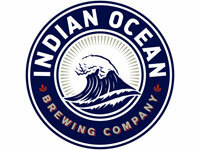 Out past the Northern suburbs of Perth, the Indian Ocean Brewing Co sits on Mindarie Marina looking out over the water. As brewery views go, there's not many that would beat it: palm trees, blue skies, yachts, endless ocean. It's a view that comes with the added advantage that the attached venue offers the full Indi range of beers and cider and a menu that suits both an evening session or an afternoon with the family. The brew kit was originally installed back in 2006 and has been in operation ever since under various brewers. Since early 2016, Jackson Purser has been heading the brewing side of operations, with Brody Watts at his side, following in the footsteps of well-travelled brewer Mal Secourable and ex 3 Ravens brewer Dave Brough. The pair wasted little time putting their spin on things, dismantling and rebuilding the brewery (squeezed into a small pocket of the vast venue), tweaking the core range (and snaffling five medals at the Australian International Beer Awards soon after) and adding a colourful range of seasonals. They're colourful beyond what's in the glass too; they created eye-catching decals that are as much work of art as something to stick on a tap. While the best way to sample the full range is by taking a trip to Mindarie, Indian Ocean beers are appearing with greater regularity at Perth's key beer venues too, such as The DTC, Petition and Five Bar. Indian Ocean Double De-Husker Du? Oaklore is available in limited, wax dipped 750ml bottles from the brewery and will hit select WA retailers into the New Year. Available on tap & in CANimals from the brewery and at select WA venues and growler filling retailers.